SSI Research Findings: A summary of the final report submitted by Dr. George Friedman to the SSI Directors appears beginning on this page. Included in the feature are his recommendations to the Board for continuing research. Surgery 2001 by Shaun Jones begins on page 9. This interesting paper describes the ability of a surgeon to use new technologies such as telepresence, non-invasive imaging, remote manipulation and 3-D visualization to perform sophisticated procedures on patients located far from the surgeon. Originally developed for use in the battlefield, Dr. Jones emphasizes the importance of this technology in treating patients in the far reaches of space. Space-Our New American Frontier begins on page 5. 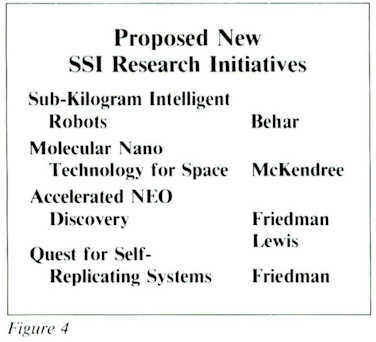 This article written by Gerard K. O’Neill in October, 1985, provides background and validation for SSI’s current and proposed research programs. About the Institute appears, as always, on the back page. This page was designed to provide basic information about SSI. We hope that you will share this in formation with a friend or colleague. To fund SSI’s research program, we need your support. Please help 1996 be successful by signing up a new member or Senior Associate. Items for Sale: On the inside back cover appears a list of items for sale. The appearance of the page remains the same, but often the items or prices change. Orders will be accepted using only the most recent issue’s information. If you are in doubt or have any questions, please contact the SSI office for updated information. The Institute has always focused on ways to hasten the human breakout into space. To that end our founder, Gerard K. O’Neill, and our collegues have spent a good deal of time and effort on ways to reduce the time and cost required to achieve a breakout into space. O’Neill suggested ways to use the basic laws of physics to leverage our way out of the gravity well of the Earth, but whenever possible, using materials outside of that well. The culmination of SSI’s early years of mass-driver research and the Institute’s systems approach can be found in an article by O’Neill, O’Leary and Driggers entitled New Routes to Manufacturing in Space. 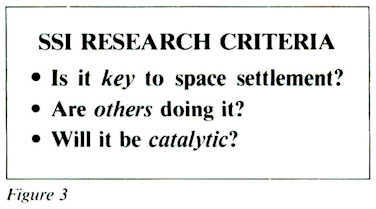 (Reprinted in SSI Update Issue 2, Volume XXI, 1995). 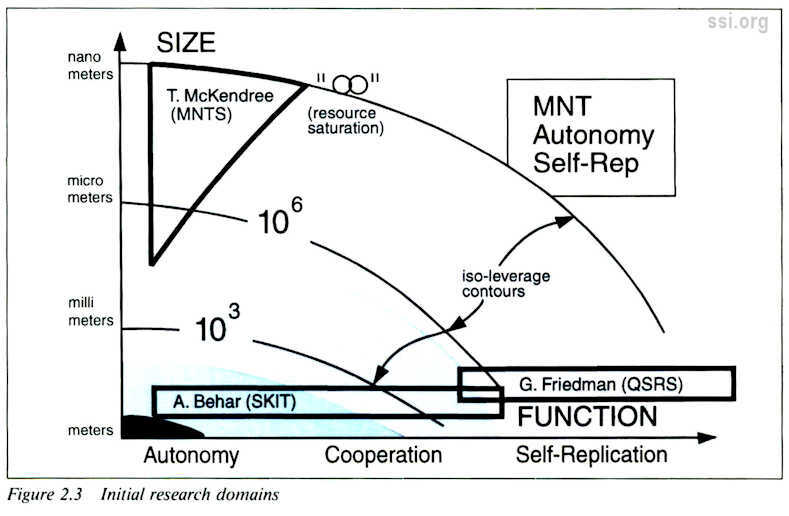 Considerable progress has been made in the theory of self-replicating systems since the article written in 1980. Due in large part to the tremendous advances in computing technology, there has been a boom in interest in the fields of artificial life and artificial intelligence. Computer simulation enables interesting experimentation in this area using personal computers. However relatively little practical work has been undertaken in the development of partially­replicating systems. The need for such systems is even more apparent than O’Neill predicted in 1980. The cost of spaceflight remains very high. The Shuttle-based cost per pound number used in the New Routes article appears, at best, quaint today. Moreover, it has been argued (by Michael Griffin et al.) that the cost of chemical propulsion to orbit is unlikely to ever be less than several hundred dollars per pound. Therefore there is strong incentive today for us to apply our efforts to the problem of development of the smallest practical “seed” which can be planted in a lunar or asteroidal environment to begin the partial replication process. O’Neill referred to the issue as the “scaling” issue. The main proposed project described in this issue of Update, goes to the heart of the problem of the robotic and telerobotic requirements of the seed. Furthermore, the present NASA examination of Space Solar Power indicates a strong need for capable automation and teleoperation for the deployment and construction of large-scale space power systems including those that will send the first electricity to the Earth’s surface. 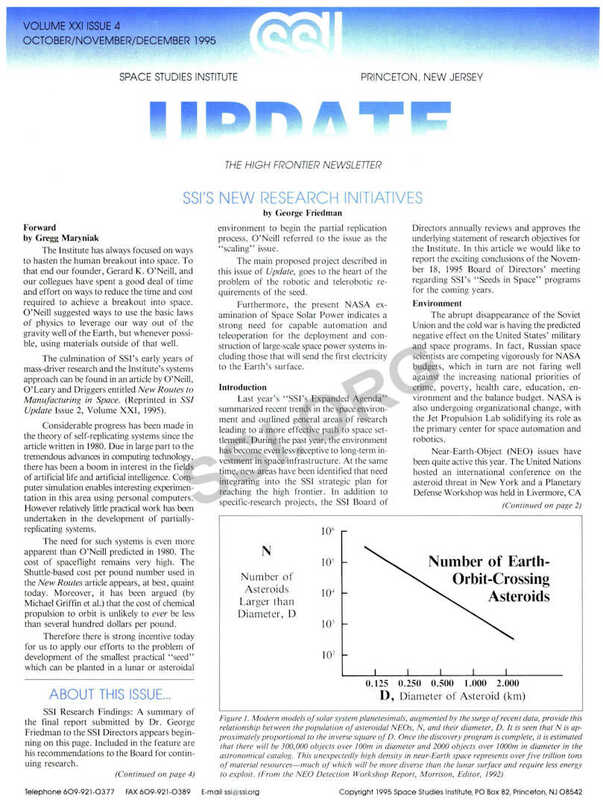 Last year’s “SSI’s Expanded Agenda” summarized recent trends in the space environment and outlined general areas of research leading to a more effective path to space settlement. During the past year, the environment has become even less receptive to long-term investment in space infrastructure. At the same time, new areas have been identified that need integrating into the SSI strategic plan for reaching the high frontier. In addition to specific research projects, the SSI Board of Directors annually reviews and approves the underlying statement of research objectives for the Institute. In this article we would like to report the exciting conclusions of the November 18, 1995 Board of Directors’ meeting regarding SSI’s “Seeds in Space” programs for the coming years. The abrupt disappearance of the Soviet Union and the cold war is having the predicted negative effect on the United States’ military and space programs. In fact, Russian space scientists are competing vigorously for NASA budgets, which in turn are not faring well against the increasing national priorities of crime, poverty, health care, education, environment and the balance budget. NASA is also undergoing organizational change, with the Jet Propulsion Lab solidifying its role as the primary center for space automation and robotics. Near-Earth-Object (NEO) issues have been quite active this year. The United Nations hosted an international conference on the asteroid threat in New York and a Planetary Defense Workshop was held in Livermore, CA in May. This latter workshop not only unified the previously contentious NEO Detection and Intercept Workshops, but it included contributors from NASA, DOE, DOD and international space organizations – including a dozen Russian scientists. 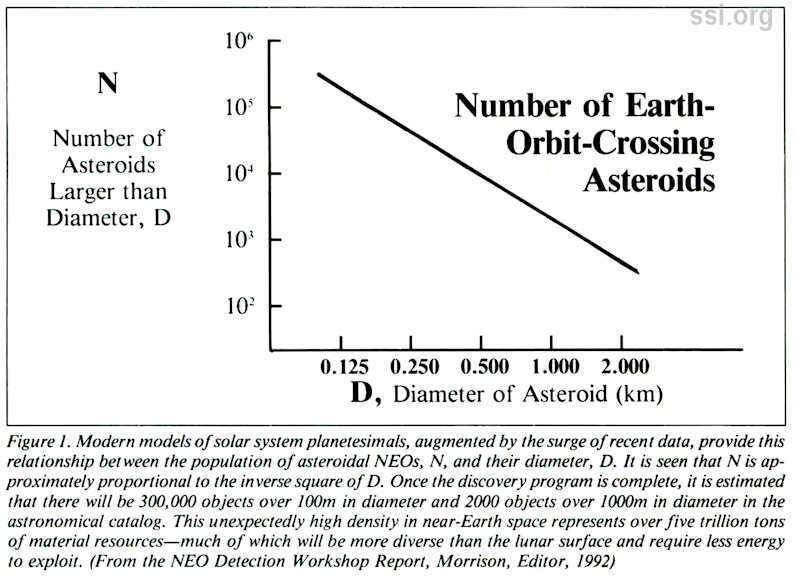 The class of threatening NEOs was expanded from the previous 2000 objects over 1km in diameter to the almost million objects over 100 meters in diameter (see Figure 1). 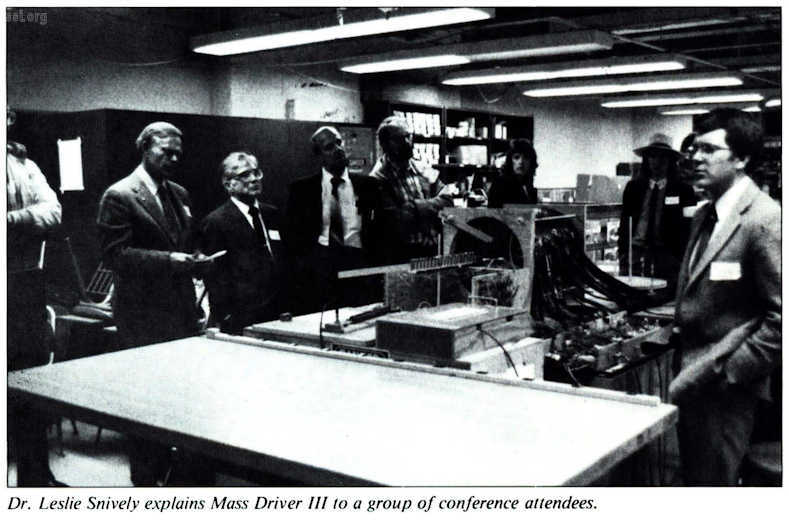 Gene Shoemaker, directed by Congress and NASA to develop a plan to accelerate the detection of NEOs, presented a program costing less than half that presented by the Detection Workshop in 1992, yet it was still rejected by NASA. The SSI view of NEOs is that, although they are a potential threat, they are also an enormous opportunity. They represent very valuable resources that are especially needed during the early phases of the march into space. Of all the technologicaf surprises of the past few decades, these two remain as the most noteworthy for our purposes of furthering the High Frontier: The greatest disappointment is that the cost to lift a point from Earth to orbit has not decreased as projected; indeed it can be claimed it has not decreased at all. The greatest miracle is the astounding advance in computer science and communications, surpassing even the most optimistic projections of four decades ago. These observations provide us with an opportunity to reassess the most effective pace and balance of space settlement strategy and specifically to examine the value of unmanned “seeds in space” as precursors to human activity. Since the expected decrease of the cost per pound into space is not happening, we must use the unexpected advances in computers to increase the effectiveness of each of these pounds by orders of magnitude. To facilitate a consideration of alternatives, a two-dimensional “research space” is defined (see Figure 2.1). The vertical dimen­sion denotes the relative miniaturization of the “seed,” starting with the present state of the art (meters) and extending up to the domain of molecular nanotechnology (nanometers). 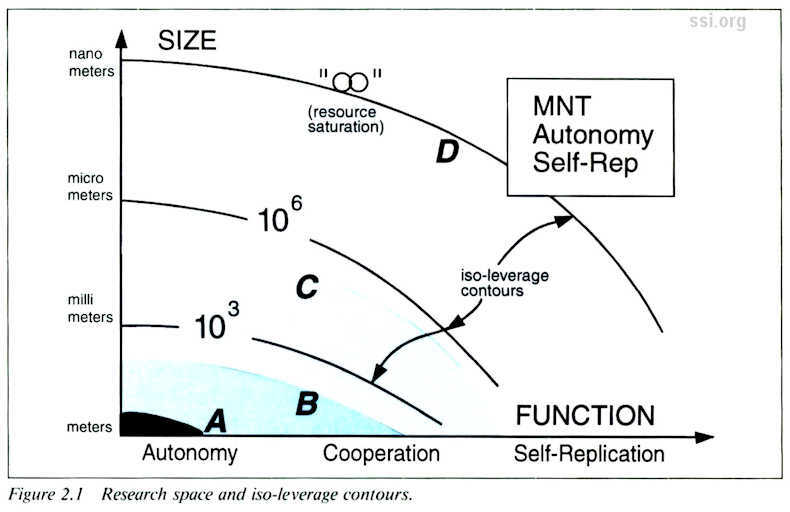 The horizontal scale is more difficult to abstract and denotes an increasingly challenging hierarchy of functionality starting with variable autonomy, rising through cooperative colonies and eventually to partial and full self replication. Figure 2.1 also attempts to assess the anticipated leverage of improved effectiveness of the research space domains. Over the past decade, a series of NASA workshops on space automation and robotics held at JPL* concluded that, even without miniaturization, meter-class telerobots could provide an order of magnitude leverage over manned missions in many instances. As miniaturization progresses through the indicated range the leverage increases, but not as rapidly as the mass decreases because of the possible need for several small robots to act cooperatively, and because some of the required task may be difficult to perform by tiny devices. Leverage is more difficult to estimate along the functionality axis, because it attempts to represent not only the increased effectiveness of presently possible robotic functions, but also an expanded variety of the robotic functionality. The ultimate leverage is achieved in the upper right hand corner of the research space with a molecular nanotechnology-based self-replicating system. This corner represents virtually an infinite leverage of exponential growth limited only by the resources available in the immediate space environment. *-SSI Director, James Burke, pioneered this effort under a prestigeous JPL Director’s Discretionary Award. Figure 2.2 broadly describes the levels of challenges in the research space domains. As previously noted, domain A, close to the origin, represents the present state of the space robotics art. Domain B, near the thousand­fold leverage contours, represents innovative systems and hardware development. Domain C. near the million-fold leverage contous does not require technological breakthroughs but a major development campaign, supported by major resources, would be required. Finally, the ultimate domain D will require at least two types of breakthrough to accomplish the actual synthesis of molecular nanotechnology devices useful for space and the achievement of real-world machine self-replication. It is interesting to note that these criteria are similar to those which apply to the research project of a space-oriented PhD. candidate. Furthermore, it has often been remarked that the best bargains in the research world are PhD. students directed to the right problems. support the “seeds in space” strategy and are plotted on the “research space” of Figure 2.3. Only the Sub-Kilogram Intelligent Telerobotic (SKIT) project will require financial support at this time. The Institute for Telerobotic Space Development (ITSD), founded earlier this year by Dave Gore (see announcement, page 00), will join SSI in supporting the SKIT project. A summary of the SKIT project and an overview of the others follow below. The Sub-Kilogram Intelligent Telerobotics (SKIT) Project. This project concentrates on domain A of the research space defined in Figure 2.3. It will be the primary thrust of the Ph.D. research performed by Alberto Behar, under the guidance of Professor George Bekey, the chair of his committee. I will also serve on this committee. The work is expected to be complete in the spring of 1997. SKIT’s operational environment will address the gathering of scientific data, prospecting and exploitation of near-Earth-orbit asteroids. In contrast to missions on lunar or planetary surfaces, the landscape is expected to be more craggy and the gravity almost zero. In contrast to previous architectures employing large (over 1000 Kg), multipurpose robots, SKIT will examine the potential of a colony of cooperative telerobots, each of which is miniaturized to under a kilogram in mass. The telerobot links will always have the availability of the intelligence and judgment of a remote human operator working through a data link with time lags ranging from under a second to over an hour. Thus, the concept of variable autonomy will be a key research issue. Another closely related issue will be distributed vs. concentrated control. It may be more effective to concentrate SKIT’s computational assets into a hierarchy of a “central headquarters” and subordinate actuators instead of attempting to control each unit by a dedicated remote operator. Navigation and mobility on asteroidal surfaces represent new challenges due to the anticipated extreme ruggedness of the surface and the infinitesimal gravity. Even the most minute propulsive forces will threaten to throw a unit into escape velocity. A possible solution is to have the robots navigate via a web of tethers which are anchored to the surface at several points. Conceivably, this web could also be used for transmission of data and power. Miniaturized sensors will be designed which can perform qualitative and quantitative chemical analyses of the asteroidal surface and subsurface material. This will include scientific and prospecting functions, examining not only chemistry and mineralogy, but mapping the surface structure and integrity as well. The next steps into exploitation will be examined by designing the capabilities which lead to these manufacturing functions: chipping, scraping, drilling, sawing, milling, hammering, moving, holding, heating, melting, welding, casting, plugging and unplugging. Rather than requiring each unit to carry the full diversity of special tools for the spectrum of functions (the “Swiss army knife” approach), the architecture of a centralized tool storage kit serving units which have a tool replacement capability will be explored and designed. The issue of size will be addressed with respect to the set of functions desired for SKIT. Recalling that the major motivation for miniaturization is reduction of the high cost to lift mass from the Earth’s surface to orbit, it should also be noted that the reduced mass of the telerobots may also increase the difficulty of executing some of the desired functions. The potential difficulties appear to be the least for the scientific and prospecting functions and the greatest for the exploitation functions. The fundamental issue of the practicality of small tools to produce large structures and systems will be examined. When observing the output of a single machine shop, one may feel pessimistic. However, when observing the real world of gigantic buildings and even larger power, information and transportation infrastructures – all built with tools which are tiny compared to their products – one should gain optimism that small tools, properly utilized and organized, can build structures large enough to be useful for space exploitation. In summary, the members of a SKIT colony appear to fall into at least these three classes: (a) the home base units, which are transportable but not mobile, and perform the centralized functions of headquarters control, power management, tool storage, systems status measurement and parts replacement; (b) the mobile workers which perform the science, prospecting and exploitation functions; and (c) the helpers which deploy the anchors and webs, move and hold objects, provide messenger functions, and otherwise assist the members of classes (a) and (b). Based on the outcome of the operations and design analyses, an interesting subset of the SKIT system will be constructed for a feasibility demonstration of the principles developed and will be tested to advance the theory of miniaturized, cooperative, telerobotic colonies. Thus, a new robotic concept, substantially more effective than previous hardware and systems, will be built and tested. Recommendations for future research paths advancing this field will also be provided. This is another Ph.D. research project planned for completion in the spring of 1997. The principal investigator will be Tom McKendree, a long-standing member of SSI and a graduate of ISU. I will serve on his dissertation committee, and his activity will be supported by his company, Hughes/General Motors. McKendree will address two major interrelated issues related to the high frontier, space manufacturing and space transportation. He will begin with established “location theory” models which support decisions regarding the geographical placement of terrestrial factories as a function of the manufacturing investments and the locations and costs of all resource inputs as well as market outputs. This model will then be expanded to space with its very interesting aspects of the costs and timing constraints of astrodynamic maneuvers. Finally, the impacts of molecular nanotechnology will be assessed. The MNT impacts on space transportation which will be examined include lowered cost conventional rockets, feasible skyhooks and momentum transfer tethers, and ultrathin solar sails. The MNT impacts on manufacturing which will be examined include low cost, multiproduct manufacturing, minimal tooling, high-strength structures, synthesis of “vitamin parts” and self-replication. John Lewis and I have an ongoing involvement with the NEO world. We both participated in the Livermore Planetary Defense Workshop; Lewis provided his expertise on the nature of asteroids and comets, and I represented the AIAA as primary author of the position paper advocating a response to the NEOs, both as a threat and as an opportunity. A few SSI members have expressed concern that we will threaten the High Frontier mission by diverting our resources to NEO issues. However, the SSI Board of Directors determined that encouraging Lewis and I to continue our relations has many direct advantages to the goals of SSI. Most importantly, a more likely outcome of ANEOD than the discovery of a threatening object if the discovery and accurate orbit determination of a million new mini-worlds containing trillions of tons of richer resources than the lunar surface and often requiring less energy to exploit. Another advantage is that both Lewis’s and my involvement in the larger space community provides SSI with additional credibility and leverage. For example, early next year, Lewis will add two more books to his outstanding list of publications on space resources, and I will continue to chair AIAA’s Planetary Defense activity. It is emphasized that we are not contemplating financial support by SSI for this project. Despite the rejection of Shoemaker’s plan, NASA will still fund NEOD activity at about the $1 million annual level, and more is being supported by DOE, DOD, The Planetary Society, The World Space Foundation and the International Astronomical Union. In view of all this ongoing activity, an SSI financial contribution to ANEOD would not appear to satisfy the “catalytic” criterion. 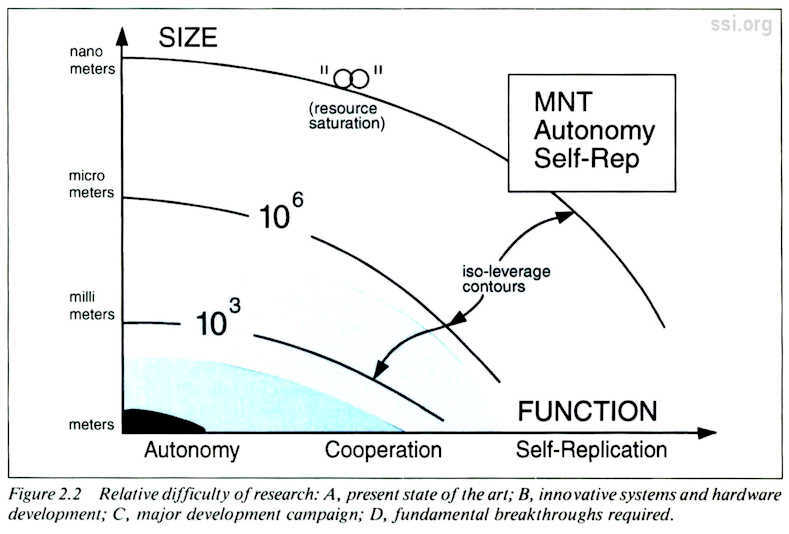 In a 1985 SSI Update, Gregg Maryniak wrote a compact and insightful paper on the feasibility and high leverage of self-replicating systems for the High Frontier mission. Unfortunately, since the seminal papers by von Neumann on the general theory of automata and self-replicating systems, the research history of actually achieving a real­world, nonbiological self-replicating system has been very spotty. 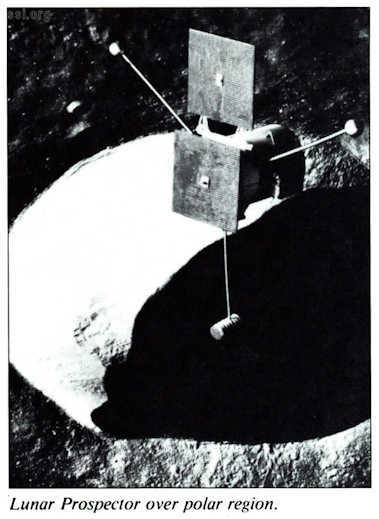 A spurt of high interest occurred in the early 1980s, notably an intensive NASA-sponsored summer study (Ref: CP 2255) recommended an ambitious program for a self-replicating factory on the lunar surface. This program was not funded, and its authors appeared to have stopped publishing. This and other activities spent more effort analyzing the exponential growth of a self-replicating system ifone could be constructed than on the deep issues of self-replication itself. The focus on building von Neumann’s “kinematic model” of self-replication with real-world machines has been largely abandoned in favor of “cellular automata model” which attempts to exhibit self-replication as a logic program within a digital computer. Almost all of the advanced researchers in the recently defined field of Artificial Life ­ which has appeared to have subsumed self­replication – are concentrating on the cellular automata model rather than the kinematic model. Encouraging progress is being made in these cellular automata activities. The surprising depth of the logic required for full self­replication is somewhat reminiscent of other computer science projections in artificial intelligence, such as chess playing and automatic language translation. The technology forecasters underestimated the computational requirements for these applications by several orders of magnitude. However, the relentless advance of computer science has brought these ambitious goals nearer to reality. Hopefully, continued advances in computer hardware and logic understanding will exhibit self-replication, first as an internal program, then as a simulation of an external system and finally, completely out of the computer womb as a real­world self-replicating machine that would be useful for space applications. Under the advice and encouragement of SSI’s Board of Directors and President, I will continue to search for SRS research projects which hold a reasonable chance of meeting criteria. No financial support is anticipated until the project is better defined. The environment and technology have changed dramatically since SSI’s founding. However, if we are insightful, opportunity can arise from turmoil. The disappointment of space launch costs not decreasing can be more than compensated for by the application of adanced robotics, computer science and communications. The research projects described above cover key domains within the “seeds in space” concept which supports the strategy of vigorously applying these rapidly advancing technologies. Undertaking these activities, coupled with continuing maintenance of our previous projects, will support SSI’s leadership role of providing a unique, innovative and effective path to the settlement of space. In 1893 Frederick Jackson Turner, having seen America grow from a narrow East­coast beachhead to span a whole new continent, perceived the deep significance of the successive opening of new Westward frontiers. He concluded that the pioneers equal to the wilderness were necessarily hardy and independent. They personified the ideal of frontier men and women, individual and American. Turner was sure that their challenge and their success had given America a freer, more self­sufficient society, and with it a stronger expression of the democratic faith. There is opening before us now a new frontier in space. I believe that it offers to Americans as individiuals, and to our country as a nation, an opportunity even greater than our 19th Century Westward frontier. Our pioneer ancestors had to be pragmatic and realistic to survive and prosper on their frontier. That should be our spirit as we strive to meet the challenge of our frontier ­ the solar system. The magnet for the Westward Movement of our 19th Century was the wealth of resources on successive new frontiers. The driving force was the desire of Americans to build and create in freedom, working as their own bosses. We can offer that same chance to our children. As in the Westward Movement, we need to “go for the jugular.” That means the energy and material resources of space. A growing, wealth­generating civilization needs three things: energy, materials, and the intelligence to use them. In high orbit, and everywhere else in the solar system except in the shadows of planets, sunlight is a full-time, intense, totally reliable source of energy. The available materials in space are those of the Moon and the asteroids. They have great value, not because they are different from elements found on Earth, but because of their energy of height. They are at the top of Earth’s gravitational mountain. Earth’s surface is the bottom. Because of that difference, it takes less than 5% as much energy to lift materials from the Moon ito space as it does to lift an equal amount from the Earth. With no processing at all, lunar materials can provide us with one essential for long-term work in space: shielding of living and working quarters against cosmic rays. And research funded privately is now being directed toward fabricating the lunar soils, just as they are found, into strong, tough composite building materials. We can do even more if we separate the lunar materials into their pure elements. And thanks to the Apollo project, we do know what the Moon is made of. 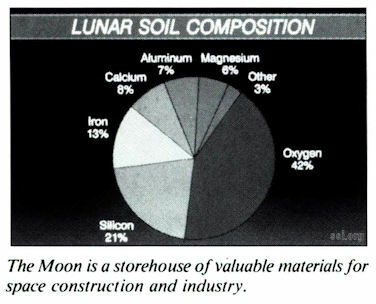 The average shovelfull of lunar soil is rich in metals, and is about 20% silicon, just what’s needed for solar cells. But the most abundant element of all in the lunar soils, 40% of the total, is oxygen. And oxygen is 5/6 of what rocket engines burn. So at the very least, the Moon is like a tank farm in nearby space, a source offuel for our rockets. And oxygen has other vital uses. It’s all we need for breathing, because our bodies don’t use up the nitrogen in the air. Oxygen is also the main constitutent of ordinary water. The remaining common lunar elements, silicon and the metals, can be used for construction of every kind of large structure needed in space. There is also a strong possibility that specific areas contain even more valuable paydirt. Over 25 years of theoretical research by many scientists have indicated that there should be mines of carbon, nitrogen and hydrogen, elements necessary for sustaining life, waiting for us frozen in permanently shadowed craters near the lunar poles. Another high-payoff prospector, similar in spirit to the Lunar Polar Orbiter, is an un­manned telescopic probe to circle the Sun, inside the orbit of the Earth. It would look outward with the Sun at its back. Research indicates that there should be trapped asteroidal material in the Earth’s orbit, and such a probe should find it. The payoff comes because that material, if found, could be retrieved for an energy cost less than a thousandth of what it takes to lift materials from Earth. Farther away, but well with the reach of our rockets, the main belt asteroids circle. Many asteroids, including the largest of them all, Ceres, almost certainly contain not only oxygen and the elements for construction, but also carbon, nitrogen and hydrogen, the elements necessary to sustain life. Knowing that the energy and material resources for industry are waiting for us in space, we must establish an essential third point before we think of the solar system as our potential next frontier. Can people live and work out there comfortably? The answer is almost certainly yes. But the easy inexpensive tests that would verify that fact have not yet been done. All 25 years of manned spaceflight have taught us two things. One is that human physiology is NOT designed for zero gravity. The longer people remain in zero gravity, the greater the deterioration of their bodies. We’ve also learned that for all the fun astronauts have as free-flyers in space suits, it still takes a long time in one to do a job as simple as changing a light bulb. That’s no way to achieve industrial productivity. Both these problems are soluble in simple ways. We’ve known since the time of Newton that rotation provides the equivalent of gravity. We could provide gravity for living quarters in space simply by attaching two small crew compartments to each other by a cable, and rotating one about the other. From such tests we can learn how much rotational gravity is needed to keep people healthy, and what rotation rates are comfortable. Once we learn the answers, there will be no limit to the time that ordinary people can remain in space. The second problem, how to provide convenient, shirtsleeve environments where people can work efficiently, also has an easy solution. That is to build airtight “drydocks” with atmospheres. Knowing that we can find the essentials for working and living in space, we can then look back to our own nation’s history as a guide to our future. As happened in 19th Century America, first will come the prospectors, then the miners, then the builders. we had 15 years ago but have since abandoned. The first is the ability to move easily between low Earth orbit and orbit about the Moon. The second is the ability to land on and take off from the Moon. For economy, the spacecraft for both tasks should burn lunar oxygen in their rocket motors. It could be used in two ways: as a catapult to bring materials from the Moon to high orbit, or as a rocket engine in space, able to use any available material as fuel, from salvaged orbital junk to raw lunar soil. The mass driver has demonstrated an acceleration so high that it could bring materials to the lunar escape speed in a length of under 200 meters. Such a mass driver could launch 100 times its own weight every year, and go on doing so forever, running on solar energy. 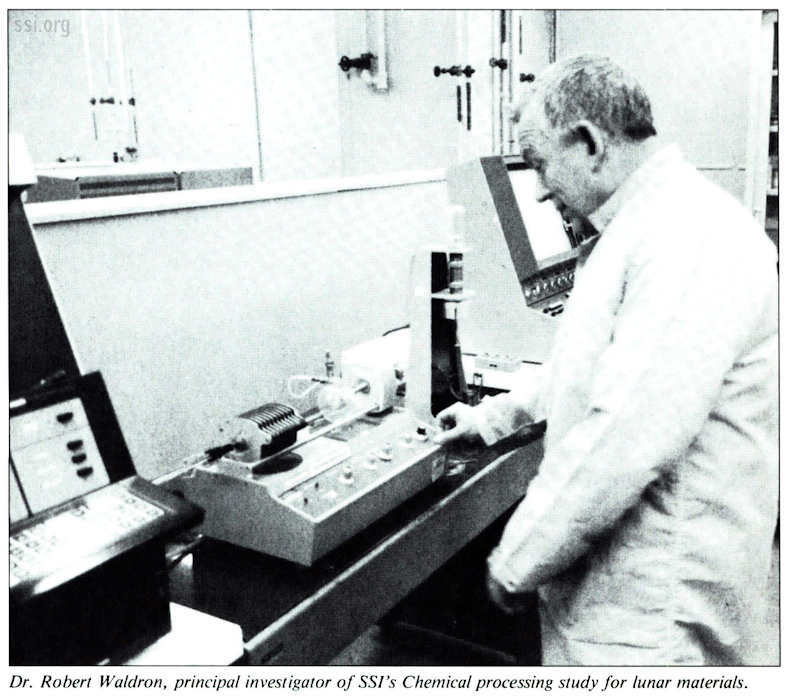 Rockwell International, working under contract from SSI, did chemistry research to prove that the lunar materials could be converted by well-understood industrial process chemistry into pure metals, silicon and oxygen. Right now, research is being done under additional SSI grants. In each case, the goal is obtaining data that will be directly useful in opening the space frontier. To develop a productive industry in space, able to expand its capacity as the markets demand, we need to take a tip from the developments in automation and robotics that have occurred in factories on Earth during the past 15 years. The most economical route is to develop three modular building­blocks, each one small enough and light enough to ride to high orbit on an existing rocket. The first is a full-scale mass driver, ready for assembly in space. The second is a chemical processing plant for use in space and on the Moon. The third is a general purpose “job shop,” a small factory with robotic equipment of the kind already in routine use for building cars. All three of those modules would be directed by radio and television from the Earth, and visited only as necessary for repairs. While the markets for products in high orbit are small, a few thousand tons per year, those first industrial building blocks can satisfy the demand themselves. When the demand grows large, those first modules will “seed” the construction of more, identical mass drivers, processing plants and job shops. It’s not necessary for them to build difficult complex items like computers and machine tools. Those are light, and we can bring them from the Earth. The space factories are better suited to building simple, repetitive components like electric coils, tubing and castings. But those are by far the weightiest parts needed for replication. The first modules in place will build a second set; those will build two more; the four will build four more, and so on, in a progression 1-2-4-8-6-16-32-64-128. Those seven doublings will lead to a space industry able to turn out about 100,000 tons per year of finished products. In constructing the building blocks and seeding the bootstrap process, we will have kept our options open, so that we can quickly seize new markets as they develop. The industrial revolution of the 19th and 20th centuries, and the direct experience of the space program so far, shows that those markets are far more likely to be identified by private enterprise, especially by entrepreneurial companies, than by government planning. One product, still speculative, could be the largest of all – solar power satellites. Fifteen years of studies in several countries have shown that we could intercept the full-time solar energy of high orbit on large silicon arrays, transform it to energy we could all plug into. That form of energy would produce no radioactivity. Nor would it spew carbon dioxide into the atmosphere as fossil fuel generating stations do. Building those power stations in space, for sale to all nations, could be a great new American industry. Worldwide needs for new central-station electric plants arise from simple replacement of old plants – about 3% per year – and from world growth in new energy needs-about another 3%. The total comes to a market of about $400 billion per year, an export market more than 10% as big as our entire gross national product. There’s a crude way of satisfying that market, and the Russians announced in January 1985 that they will try that way: building giant rockets to lift all the pieces of solar power stations into high orbit. Their goal is to have an operating satellite power station before the year 2,000. Their costs will be enormous, and the environmental consequences of their rocket emissions will be horrendous. If we decide to go for that market, we can undersell the Russians and avoid environmental damage by using the bootstrap process. Our logic will be as basic as building a house at the top of a tall mountain: quarry the stone at the top, rather than hauling stones from the bottom. To keep that cost-effective option alive a research group in Seattle, working under still another SSI grant, is designing a solar power satellite to be built in high orbit from processed lunar materials. The Japanese are also strongly interested in solar power satellites. Going by their track record in automated manufacturing, they are likely to be our toughest competitors in that market. There has been careful study of large­scale habitats, slowly rotating spherical environments in space. They will be highly Earth­like, with parks, grass, trees, flowers, natural sunchine, normal gravity and atmospheres. That is essential if the solar system is truly to become our next frontier. When the industrial workforce in space becomes big enough, cost economies will dictate diverting a few percent of the industrial capacity out there to building space habitats where families can live for long tours of duty. Space habitats don’t have to be built as high-tech artifacts. They’ll control their temperatures, and therefore their climates, seasons and weather, simply by opening and closing their window shades to let in sunshine for days as long or short as their residents like. And they’ll grow their own food by the plain old techniques of dirt agriculture that we’ve learned during the past 10,000 years. Both the size and mass of space habitats will be comparable to those of big oceangoing ships. The biggest economical space habitats will be about 450 meters in diameter, comfortable for about 10,000 people, the population of a small suburban town. Smaller test models, for 150 to 500 people, can be built in low Earth orbit. A year’s accumulation of Shuttle external tanks in orbit is enough material to build one. In the long run, space habitats can be located on orbits anywhere in our solar system. Like the mining and farming communities of our American West, they will be located in places that make economic sense, many of them close to mineral resources. Over the historical future there is material enough in the asteroid belt alone to build space habitats with a total land area thousands of times as large the Earth’s. Just as happened during the 19th Century Westward Movement, there will be adventurous people, most but not all of them young, who will strike out for that new frontier. And as before, there will be plenty of others who elect to stay behind. If we get our act together, the long-term prospect for America in space is excellent, for reasons that are fundamental to our American ideals of human freedom, dignity and independence. It is wholly in our Western tradition that space communities can be self-supporting, self-governing, and free to determine their own destinies. Like North America since the 1600s, they will export both wealth and their creative ideas in technology and governance to the land that gave them birth. We of the Western Democracies have everything to gain and nothing to fear in that prospect. But any dictatorship will be helpless to exploit an opportunity that depends on trusting its people, at distances too great for direct control, to manage their own lives. That is why a truly productive space program, starting strong and soon, can be our greatest long-term weapon in the age-old struggle for freedom and peace. Is life on Earlh under a death sentence from space? In the first book for the general reader that presents the full range of scienlific evidence for the past and possibly future dangers, noted planetologist and impact-crater expert, John S. Lewis, shows us the unmistakable evidence ­ from space probe flybys of the planets to the scars on our own Earth – of cataclysmic comet and asteroid impacts. By comparing what we know about the Earth’s geology and paleontology with the images of the other planets and moons in our solar system, Lewis makes the strongest case yet for sudden, dramatic extinctions and assess the risks to planet Earth. Not even Darwin was aware of the events now seen as having played such a crucial role in the evolution of life on Earth. Many of the impacts the Earth has sustained were seen and recorded in historic times, for example, the explosion in the early twentieth century of a giant comet fragment over the Tunguska region of Sibera, which flattened trees and killed animals for miles around, and we heard and felt as far away as the British Isles. That impact and others have had devastating effects, similar to those of a multi­megaton nuclear burst. Further on, Lewis tells of the dangers to our civilization, dangers in the form of near-Earth asteroids, or NEAs, whose impact could destroy in an instant what it has taken humans millennia to build. Finally, he describes the searches and preventive measures being undertaken today by scientists around the globe to ward off this threat from space. The conclusions Lewis draws from the evidence will fascinate and terrify the reader with their implications for the future of our planet. John S. Lewis is Co-Director of the NASA/University of Arizona Space Engineering Research Center, Commissioner of the Arizona State Space Agency, and an SSI Director. 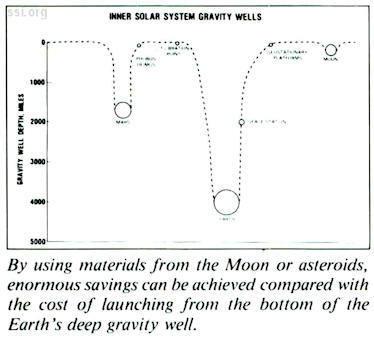 He is currently working on a book about the uses and opportunities of asteroids and comets for our future in space (also from Addison­Wesley, 1997). SSI Members and Senior Associates can order Dr. Lewis’ book at a 20% discount prior to February, 1996. The special price is $20.00 plus $4.00 postage within the US. SSI has negotiated a special discount for its members to the National space Society’s 1996 International Space Development Conference (ISDC) in New York City next Memorial Day Weekend. ISDC 96 comes to the Grand Hyatt New York, in midtown Manhattan, Thur-Mon, May 23-27. Not only is this an opportunity to attend an exciting space conference, but a great way to experience all New York has to offer at a fantastic NYC hotel rate. With its theme of “Small Steps, Giant Leaps,” ISDC 96 will juxtapose Government and Big Business space projects with those of entrepreneurs and volunteers in its two main program tracks. Rounding out the tracks are technology and education, as well as co­located special events. Entrepreneurship, Orbital Tourism, New Space Markets and Volunteer Space Projects. Large-Scale Programs Track: Includes New Launch Vehicles, Solar Power Satellites, International Space Station and Robotic Planetary Exploration. Technology Track: Includes Interstellar Flight, Space on the Internet and Telerobotics. Education Track: Includes Educator Resources and Hands-on Workshops. 1996 New York Space Expo: General-public talks by astronauts and visionaries; exhibits, space collectibles shown, space art show. • Launch Vehicle Technology (Thur. 5/23) Dr. Marshall Kaplan, Launchspace Inc.
• Satellite Systems Technology (Fri. 5/24) Robert Cenker, PE, Launchspace Inc. Courses are $149 each; taking the two Launch­space courses costs $249. $50 regular/$20 student/senior through 3/1. $60/$25 student/senior through 5/1. $90 regular/$35 student/senior thereafter. Make checks or money orders payable to Space Expos of America, Inc. MasterCard, VISA and American Express accepted. The objective of Myrabo’s research was to exploit wireless power transmission (microwave/millimeter) to lower manned space transportation costs by two or three orders of magnitude. Concepts have been developed for light­weight, mass-producible, beam-propelled aerospacecraft called Lightcraft. The vehicles are designed for a “mass-poor, energy-rich (i.e., hyper-energetic) flight infrastructure which utilizes remote microwave power stations to build an energy-beam highway to space. Although growth in laser power levels has lagged. behind expectations, microwave and millimeter-wave source technology now exists for rapid scaling to the megawatt and gigawatt time-average power levels. 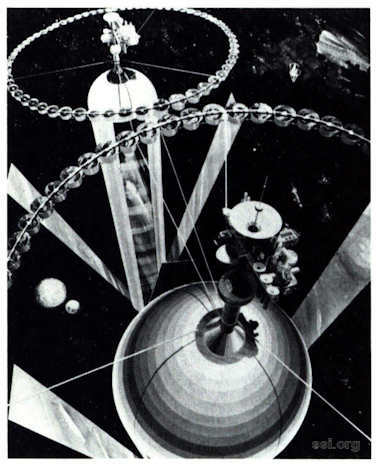 The design exercise focused on the engine, structure, and receptive optics requirements for a 15-meter-diameter, 5 person Earth-to-Moon aerospacecraft. Key elements in the airbreathing accelerator propulsion system are: a) a “flight-weight” 35GHz rectenna electric powerplant, b) microwave-induced “Air Spike” and perimeter air-plasma generators and c) MagnetoHydroDynamic-Fanjet (or MHD­Fanjet) engine with its super-conducting magnets and external electrodes. Editor’s note: This summary was omitted from the previous SSI Update. We apologize to Leik for the error. Two of the more exciting advanced information age technologies being applied to medicine and surgery are telepresence and virtual reality. Today, almost any information desired to treat a patient can be acquired electronically (or digitally); examples include non­invasive imaging (Xray, CT, MRI), vital signs, laboratory test results, patient records, treatment protocols, consultations and database searches. Physical examination, simple procedures and even basic surgery are being enabled by other sophisticated technologies allowing remote manipulation, palpation, and 3-D visualization. It is medicine’s wake-up call to the information age. The time could not be more perfect, for we now have the right type of physicians to take advantage of this new technology. The “Nintendo Surgeon” has evolved into the “Digital Physician.” Younger physicians in the video/electronic generation have, in many ways, grown up “training” with these information age technologies. Not only are they embracing and comfortable with the new technology, now they are demanding it. They play more sophisticated video games, “surf” the World Wide Web and the “information superhighway” and seek greater knowledge about their work and each other using computer-aided instruction, multimedia and virtual reality. To them, the future is Now, and it is all digital. One of the prototypic telepresence surgery systems is the Green Telepresence Surgery System1,2. It exists today as a dexterity enhancing, remote surgical system that will permit a surgeon at a hospital to operate upon a patient at a site which is distant or dangerous, such as a rural hospital, the battlefield or space station. It consists of a surgical workstation which has 3-D stereoscopic monitor, stereophic sound, and six degree-of-freedom instrument controllers (handles of actual surgical instruments) which have both the sense of touch and greatly enhanced dexterity. The system is engineered in such a way the surgeon actually feels as if the surgery were being performed directly in front of him, when in reality the remote site (and patient) could be yards, miles, or even hundreds of miles away. This will permit a specialty surgeon in a medical center to provide assistance, guidance, training and proctoring (or actually performing surgery), in a distant, remote environment. Because the system was designed to mimic open surgery, there will be essentially no training required, thus permitting surgery with all the feeling dexterity and 3-D vision of open surgery. Another telepresence surgery system created by Hunter et al3 focuses upon expanding the capabilities of human performance. In retinal surgery, the telepresence system scales the motion of the hand by up to a hundredfold, so 1 cm of the surgeon’s hand motion moves the microscalpel 100 microns, and vision magnifies the retinal vessels to the size of a thumb. By applying sophisticated signal filtering techniques through the computer interface, the normal tremor of the human hand can be removed, thereby permitting accuracy and precision to 10 microns, a hundred times more accurate that the unaided hand. Virtual reality (VR) surgical simulators, similar to flight simulators, are being designed to permit young physicians to “fly” inside of an imaginary body to learn anatomy or to practice surgery. Virtual reality uses 3-dimensional, computer-generated graphic images to create a responsive environment, and by wearing a head mounted display (with a pair of television screens in front of the eyes), stereophonic earphones, and “smart” gloves, the surgeon or student can explore the 3-D anatomy and organs as if they actually existed. The addition of virtual surgical instruments permits the practice of surgical procedures4. The level of realism today is improving quickly beyond that of cartoon graphics. New datasets from the “Visible Human” incorporate actual human data from CT and MRI scans and color phototomography. Using the “Visible Human,” the level of realism will soon become near lifelike. The addition of physical properties like organ deformation and muscle contraction, physiologic properties like bleeding or leaking of various fluids, and microscopic anatomy such as micro-glandular or neuro­vascular structures, will create a very powerful educational trainer. The challenge will be to understand how to take advantage of this technology to enhance the skills of our students and experienced surgeons. Another application of YR is in medical planning, such as civilian disasters or mass casualty care. There is a new generation of individual simulators which, like a video game, can place the individual student or physician in an imaginary place, such as disaster or battlefield. The student, medic or surgeon can then practice triage or emergency first aid, and coordinate planning and training. This individual simulator, called I-Port, has an exercycle type base that allows the student to “walk” through the scene by pedaling, and a head-mounted display to see the scenery and other players, thereby being able to interact and practice in a collaborative, distributive simulated environment. A third application is to use VR to prototype buildings, equipment and instruments. Today engineers build using a computer-aided­design (CAD) program, then test and validate it before actual construction; we can now do this for medical equipment and instruments as well. There is currently an ambitious project, the “Operating Environment of the Future,” which will build a complete operating room based upon advanced and modern materials, equipment and technology in order to totally rethink the way a surgical (or procedure) suite should be. This is based upon new requirements – “smart” materials, systems integration and information now – for the future, not upon today’s traditional architectural and engineering techniques. The room and equipment will then be “virtually” tested and evaluated (walking around, moving equipment, or adding and taking away the virtual objects) by all who will use or influence it, from physicians and nurses to administrators, material managers, clerks and janitors, in order to recruit the best ideas and optimal plan. Once everyone has had a chance to experience the room and provide a decided opinion, the iterative process will be complete and the room will be built. This is the era of change to a new world order for medicine, one in which the surgeon has the opportunity to grasp these advanced technologies, enhance skills beyond the frail limitations of the human body and dissolve time and space. The ultimate value of these technologies of robotics, telepresence and virtual reality is that physicians will be empowered to provide better care for their patients, whether on the Earth or the far reaches of space. 1. Green, PS, Hill, JH, and Satava, RM. Telepresence: Dexterous procedures in a virtual operating field (Abstr.). Surg Endosc 57:192, 1991. 2. Satava, RM. Robotics, Telepresence and Virtual Reality: A Critical Analysis of the Future of Surgery. Minimally Invasive Therapy 1:357-63, 1992. 3. Hunter, IW, Doukoglou, TD, Lafontaine, SR et al. A Teleoperated Microsurgical Robot and Associated Virtual Environment for Eye Surgery. Presence 4:265-80, 1993. The following books have been selected from dozens of candidates as the best volumes on the future of humans in space. The maintenance of this bibliography is an ongoing project. We welcome your comments and suggestions. This list is organized in rough order of the suggested age range of the books. However, it is our opinion that each of these books has something to offer for elementary level readers both below and beyond the recommended grades. Culpik, Larry, & J ames Seevers, Space Machines, Raintree, 30 pages, 1979. An excellent introductory book for the very young, this book uses colored pictures with a short explanation on each page. Covers past spacecraft, the shuttle of today, and descriptions of space colonies and solar power satellites. Recommended for grades 1-3. Ardley, Neil , Out into Space, Watt s, 35 pages, 1981. Another one for the very beginning space explorer, this book is heavily illustrated and devoted to a wide range of future space possibilities. Moonbases, space colonies, energy from space and inrerstellar arks are all simply detailed to get the youngest reader acquainted with his or her future. Recommended for grades 1-4. Fradin, Dennis, Space Colonies, Children’s Press, 45 pages, 1985. A recent, well-illustrated and clear look at the concept of human colonies in space for younger readers. Recommended for grades 2-5. Knight, David, Colonies in Orbit, Morrow , 89 pages, 1977. This book traces the very early concepts of space travel to the present ideas of today. Knight also describes Dr. O’Neill’s research findings to show the need for space colonies and all the details along with it. Recommended for grades 3-8. Zimm, Herbert, The New Moon, Morrow. 63 pages, 1980. The perfect book for the student who wants to know what the Moon is made of. Clear and concise. Recommended for grades 4-8. Collins, Michael, Flying to the Moon and Other Strange Places, McGraw Hill, 159 pages, 1976. Follow Michael Collins from his years as a pilot to becoming an astronaut. You will learn the vivid accounts of going to the Moon in the historic Apollo 11 mission, the first to land a man on the Moon. Collins accurately forecasts the Shuttle’s fuctions of today and goes on to describe living in a space colony called Libra, going to Mars and one day. he hopes, to the stars. Recommended for grades 4-8. O’Neill, Gerard K., The High Frontier, Anchor Press/Doubleday, 322 pages, 1982. Originally published in 1977, this remains the best and most important volume on space colonization. Since its original publication, a number of the engineering predictions made by the author have proven to be quite conservative thanks to the research conducted by the Space Studies Institute. Recommended for grades 5-High School. Branley, Franklyn, Space Colony: Frontier of the 21st Century, DuHon, 98 pages, 1982. Details of living, working and playing in a space colony are present throughout this book. Branley also gives fine accounts on mass-drivers as transportation engines as well as lunar catapulrs. Solar power satellites are emphasized too. This book resembles Dr. O’Neill’s book, The High Frontier, by using fururistic lerters from Space colonists to friends back on Earth. Recommended for grades 5-High School. Golden, Frederic, Colonies in Space: The Next Giant Step, Harcourt, 131 pages, 1977. This book provides excellent material on space colonies for the older child. All aspects of the workings of a space colony are present. From the designs to the actual building, its functions, and finally the day-to-day experiences are captured. Includes an interesting journal from a future space colony inhabitant. Recommended for grades 5-High School. Elementary students can successfully and safely build and fly model rockets. This sport has proved to be an effective way for young people to get hands-on experience in the laws of physics and aerodynamics. Stine, G. Harry, Handbook of Model Rocketry, New York, Arco Publishing, 1983. The finest book available on the subject. A must for every student and teacher interested in aerospace. Ask your librarian to see these articles from the back issues of the following magazines. Recommended fur grades 7-High School. Dempewolff, Richard, Cities in the Sky , Popular Mechanics, May 1975. 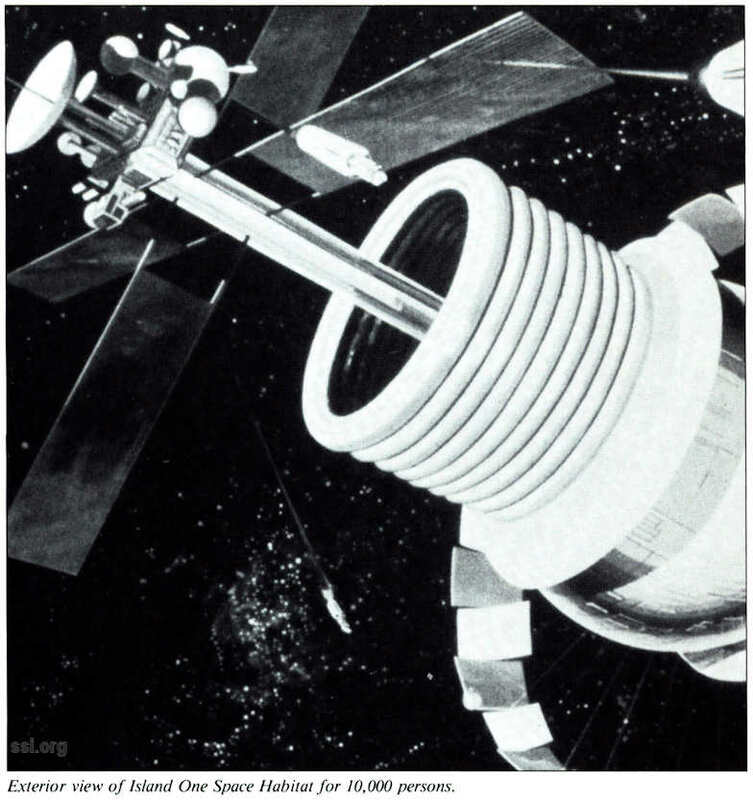 An early article on the ideas of a space colony and the steps needed to get there. Asimov, Isaac, The Next Frontier?, National Geographic, July 1976. Visit with intriguing detail the different aspects of living in a space settlement. Beautifully illustrated. Schefter, Jim, Giant Space Structures, Popular Science, March 1979. The ideas of beam building to construct large space scructures are presented by NASA and private companies. Solomon, Stephen, Amazing Machines, Science Digest, November 1980. The history, workings and potential benefits of a mass-driver located on the Moon and Earth are shown here. O’Neill, Gerard K., The High Life in Space, Omni, October 1984. Follow a group of people through their day-to-day life as they make space their new home. O’Leary, Brian, Lunar Base, Science Digest, January 1985. What good is a base on the Moon? Find out all the interesting benefits as man attempts to return to the Moon. Another fine article can be located in the 1975 Science Year ofthe Encyclopedia Britannica entitled Selllers in Space. Written by Gerard O’Neill, this piece focuses on space colonies and the people who live there. O’Neill, Gerard K., The New Amercian Frontier, Discover, November 1985. Dr. O’Neill describes how present-day technology can allow this nation to prosper in space. 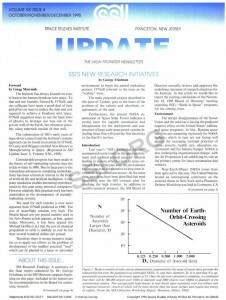 For more information on the opportunities waiting for the next generation’s leap into space, you can join the Space Studies Institute and receive its bimonthly newsletter, Update. The Space Studies Institute offers a series of bibliographies for adults and gifted students. For a complete set of six bibliographies, send $2.00 to Space Studies Institute, P.O. Box 82, Princeton, NJ. License to reprint this document is hereby given, provided that any reproduction is of the entire document. To order, circle items and mail your order to SSI, PO Box 82, Princeton, NJ 08542. The World’s Greatest Resource: An article based on John Lewis’s Banquet Address to the 1995 SSI/Princeton Conference on Space Manufacturing will be featured. challenges and commercial potential of wireless power transmission. will examine the limits encountered when one attempts to shrink the mass of the initial base.